China is a country with more than 5,000 years of history and cultural diversity. It is home to 56 ethnic groups, the largest of which is called Han, accounting for more than 98 percent of the overall population. In the past, due to mountainous terrain and lack of modern transportation infrastructure and vehicles, the communication between even the neighboring villages—not to mention counties or cities—was difficult. As a result, Han Chinese in different areas speak hundreds of dialects. One of these dialects is called Hakka. To avoid warfare and uprisings in north China, Hakka ancestors migrated to settle down in south China around 1,000 years ago. Despite their mingling with indigenous residents in south China, Hakka people preserve the language and customs of their aristocratic ancestors from the capital of the Chinese empire. Today, Hakka is the third-largest population among overseas Chinese. Famous Hakka figures include former prime minister and founding father of Singapore, Lee Kuan Yew. I speak Hakka dialect, too. Today I would like to introduce how Hakka people celebrate new year. The day before the lunar new year—December 30 on the lunar calendar—every family pastes Chinese couplets on walls. The couplets contain auspicious Chinese characters and poems, which are meant to bring about good fortune, health and happiness in the coming year. Some families pay tribute to God with a table of food, fruits, pastries and spirits, holding a bundle of incense and praying and bowing toward the table. On the eve of the lunar new year, three or four generations of family members unite to have dinner. The elders give best wishes to all family members during the dinner. After the dinner, the elders and children are given a lucky envelope that contains certain amount of cash by the family members who have the ability to earn money. Between midnight to dawn, families light firecrackers to celebrate the coming of a new year. From Jan. 1 to 3 on the lunar calendar, people visit their relatives’ and neighbors' homes and extend best wishes to everyone they encounter. The most frequently said sentence is, “Wish you happy and prosperous!” Between Jan. 4 and 20, every family visits the tombs of their ancestors to pay tribute to them. It is a solemn moment and follows a standard procedure and ritual. 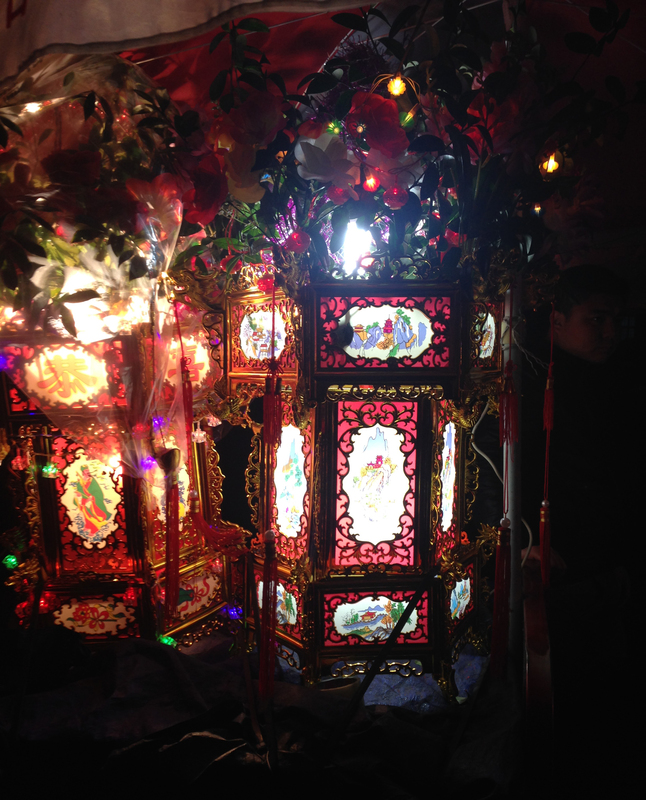 The Lantern Festival falls on the evening of Jan. 15. Hakka people take the Lantern Festival very seriously. Starting at 8 p.m., people line up to start a long march around the village. Some villagers wear ancient costumes and act like historical or mythical figures. Some villagers carry candlelit bamboo lanterns. Every community dispatches a paper-covered and candlelit bamboo dragon that consists of nine to 15 body parts, with one young man holding each body part of the dragon. Every dragon dances and swings, as if it is alive. After each dragon there comes a band. The band uses Chinese-style musical instruments, such as drums, to play melodies. With fireworks, music and candlelight, people happily march to their common ancestor’s tomb to pay tribute, and then go by each house. Each house will light firecrackers at the door to celebrate the march. The celebration usually ends at midnight.